Instead of concentrating on hate, we must always remember that love is universal, love is free, and, ultimately, love is love. In honor of Pride month, let’s highlight 11 popular characters of the LGBTQ community who gladly celebrate their pride throughout pop culture! As the most recent reincarnation of the Avatar, Korra controls all four elements; Earth, Air, Fire, and Water. The Avatar acts as a gateway and peacekeeper between the physical and spiritual worlds. Her strength and prowess at bending the elements help her maintain harmony between these worlds. By always standing up for those unable to stand up for themselves, and by staying true to her heart with regards to her love interest, Asami Sato, Korra has become a role model for children as well as adults, particularly those who can relate to her bisexuality. Way to stay true to you, Korra! The Deadpool movie was a huge success and since then we’ve seen a sizeable increase in advertisements, promotions, comics, and artwork featuring this wise-cracking character who’s constantly breaking the fourth wall! His quick wit and reckless antics have made it quite the loveable character. Speaking of love, Deadpool is famous in the comic book world for being omnisexual, meaning he has diverse sexual preferences that aren’t limited to traditional views of what that should be. He’s constantly coming on to nearly every character he meets, especially Spiderman, who he is obsessed with making his best friend. We love Deadpool for the way he so shamelessly follows his heart’s desires. This blue goddess has had terrible luck with men and women. Throughout the comics, Mystique has gone through many struggles with fellow mutant and lover, Destiny. When that relationship wasn’t working, Mystique started having affairs with several men in the hopes of getting pregnant. Lacking maternal instincts, she soon after abandoned all of her children and returned to Destiny. And what a surprise, Destiny ultimately dies. Looks like it might be a good time to take a break from the dating scene, Mystique. This justice league hunk, Alan Scott, is one hell of a superhero and openly gay. DC writer, James Robinson, wants to portray how the Green Lantern’s sexuality is less important than his personality attributes. He also describes the importance of the societal need to focus on judging the quality of his character, not his sexual orientation. Screw intolerance! This is one magical character, no pun intended. Dumbledore represents the wise, grandfather figure/mentor that we could use more of in our lives. He truly cares for the students at Hogwarts and would protect them at any cost. His wisdom and advice serve Harry well throughout the series, as it did many students before him. While J.K. Rowling did not originally write Dumbledore’s character with the intent of him being gay, she later confirmed it in an interview. For fans of the series, this explained many parts of his past and his extremely close friendship with Gellert Grindelwald. When Grindelwald revealed his true nature as a Dark Wizard, it must have been devastating for Dumbledore, and Rowling commented that he became “quite asexual,” and lead a “celibate and bookish life” afterward. Love is a powerful thing. Jack Harkness quickly became one of the most popular characters on British television after his introduction in the show Doctor Who. A former con man and companion of the Doctor, Captain Jack conducts himself with the carefree attitude that only an immortal from the 51st century can possess. His moral ambiguity can sometimes put him at odds with the Doctor, but fans of the show love him! He’s known for his good looks and roguish charm, and no one is off limits from his affection. Due to this, he has become one of the most widely celebrated and popular gay characters in mainstream British television. “What the deuce?” Stewie Griffin’s sexuality has been a Family Guy fan head-scratcher for the past fourteen seasons. One moment he’s making a transparent homosexual innuendo, but then, at other times, he’s commented on his attraction to girls. His sexually ambiguous clues may never be officially revealed, but, either way, we can never get tired of Stewie’s hilariously wicked charm. Most likely to have his eerie voice haunt your childhood dreams. Interesting enough, the iconic and sinister archvillian, Him, poses as the apocalyptic devil in the beloved Powerpuff Girls series. His evil traits are not to be linked to his place in the community, Him’s personality is just simply evil. He demonically talks through toys, thrives on others’ fear, and resurrects the dead. Great Scott! “He’s just a sweet transvestite from transsexual Transylvania.” Played by the wonderfully raunchy, Tim Curry, Rocky Horror Picture Show has become a classic cult phenomenon since its release in 1975. Now every Halloween, Rocky fans will dress in fabulous corsets, Columbia-inspired sequins, and pounds of black makeup in honor of the legendary Frank N. Furter. We all should embrace our inner sexuality like the cast of Rocky Horror! 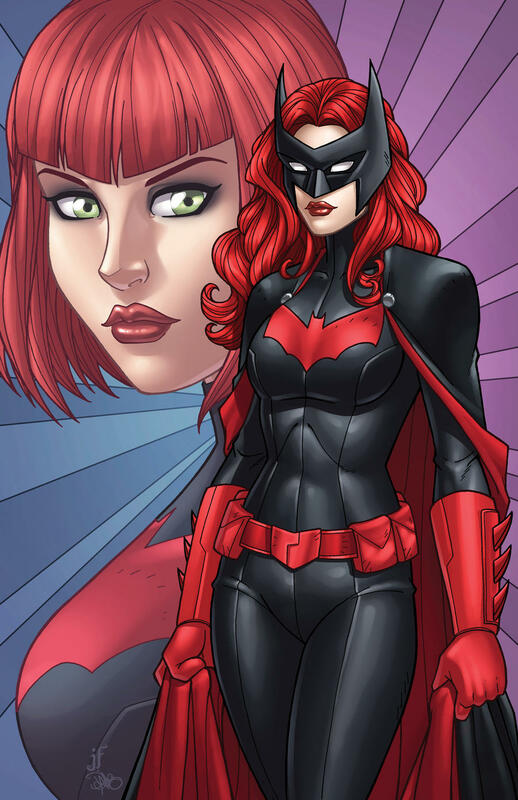 With DC Comics diversity streak, it was no shocker when DC Comic’s Batwoman came out as a lesbian in 2006. Fun fact, Batwoman is not the only LGBTQ member of the Batman franchise. Harley Quinn and Catwoman have bisexual orientations as well. There you have it! These 11 popular characters of the LGBTQ community have captured our hearts on screen and off. Comment with any popular characters that you know are a part of the community!